Now little children are a hard market to design video games for. Sure they can have childrens’ games made specifically for their age group, but then what about anyone else who would be interested in playing them? What about a game that not only appeals to children, but to adults as well and anyone in between? There may have been a few times in the past that this had been attempted but it usually always ended up leaving the middle age group in disdain. But now that the Kinect has been released there is a completely new way to appeal to every age group; especially one with cute animals. 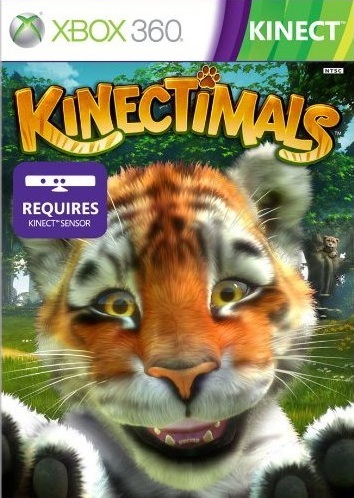 Kinectimals may have been designed for a younger audience but never before has any game that involves caring for an animal been so interactive. 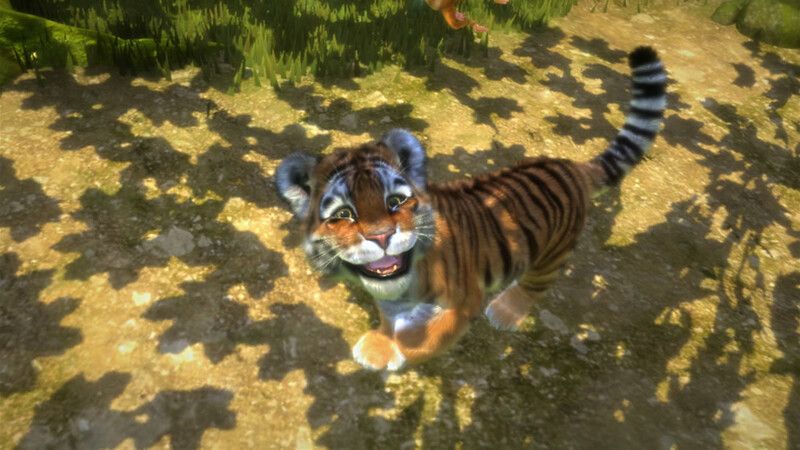 Of course your cat or dog may look at you with disdain when you start petting the virtual cubs. But in the end does Kinectimals really have enough going for it to make it not only a great game for the family, but also showcase the capabilities of the Kinect? Something that will astound many players right off the bat is the fact that the graphics are beautiful to look at. As you first begin the game and see each of the different wild cubs playing around it is evident that a large amount of care has been given to the design of each cub. Seeing the realistic looking fur on each of the different cubs is an amazing sight including their real to life movements that makes it seem like you are taking care of a real tiger cub of your own. Not only are the cubs amazing to look at but the areas are also very well designed. The jungle and island scenery that you play with your cub in are brightly colored and designed to be quite real to life. Simply taking a look at the ground that your cub treads shows how realistic the world can appear as the cub walks through the lush grass. The world of Kinectimals is filled with easy listening melodies that play in the background as you play with your pet and explore the island. The cubs themselves are very cute and the purring is amazing to hear. Too bad that there is an almost constant prattling on narrator talking in your ear. The narrator is Bumble, voiced by Richard Horvitz who had previously worked as Invader Zim on the show of the same name. He may not be a problem initially thanks to his believable delivery of the dialogue, if only he wasn’t always bothering the player. There are many instances inside of the game that the player will be wishing they could just ignore Bumble and play with their cub like they want to. As you arrive on the island of Lemuria you are immediately introduced to each of the different wild cubs that you will be able to take care of on the island. There is a small semblance of a storyline which revolves around finding the lost treasure of Captain Able Blackwood but that isn’t the focus here. What is the focus are the cute little balls of fur that you have to choose from. Right off the bat you can choose from any of the five starting felines; the Royal Bengal Tiger, Black Panther, Cheetah, African Lion and African Leopard. You are also introduced to your constantly talking buddy Bumble whom I spoke of before, which appears to be a flying fairy lemur. Thus begins your wild cub caring adventure that consists of not only taking care of your cub, but teaching it new tricks and playing different minigames with your furry friend. Your cub never truly needs to have a specific amount of treatment, but that doesn’t mean you won’t want to take care of the poor little guy either. As you explore the island your cub can grow dirty and require a quick washing to clean that dirt right off of them. You can also feed and water your cub as well to keep them happy. Plus you are able to buy different items at a store inside of the game which allows you to buy brand new toys for your cub. All of these different activities are handled through a mildly confusing menu which may seem a bit much for children at first but can be figured out with a little teaching at the hand of Bumble. The Kinect easily recognizes the different motions that you perform as you care for your pet. Petting and washing, though similar in appearance, are some of the most enjoyable aspects of the game as you see phantom hands mimicking yours and petting your cub as it purrs wonderfully in your ear. Menu navigation can also be a little troublesome with the Kinect controls, especially considering the previously mentioned fact that it may be confusing to some only made more troubling with occasionally dodgy Kinect navigation. Through this same method players will be able to teach their cubs a variety of different tricks and have their cubs mimic your motions wonderfully. There is little to no latency or mis-communication between your actions and the Kinect’s recognition system. The most noticeable issue that may arise is some detection problems with throwing objects as the Kinect seems to have difficulty determining your accuracy. 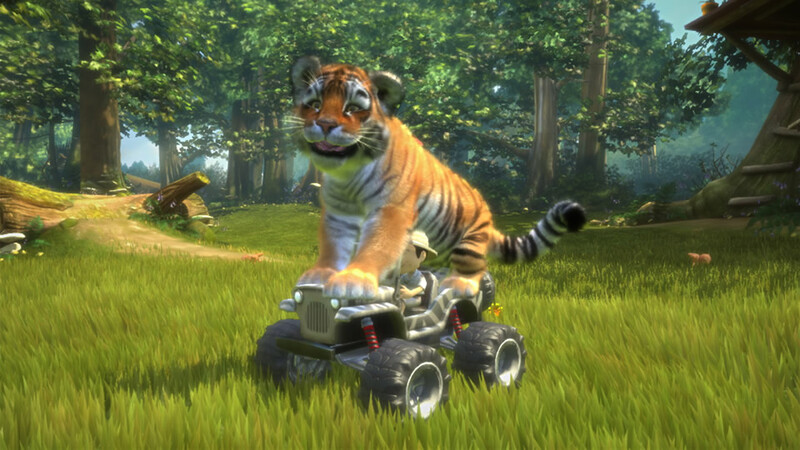 Yet this is excellent considering the fact that players must use not only their bodies and hands to interact with their cubs but also with voice commands to have your cub perform tricks on command. Not only are the tricks essential to Kinectimals’ gameplay but so are the minigames. 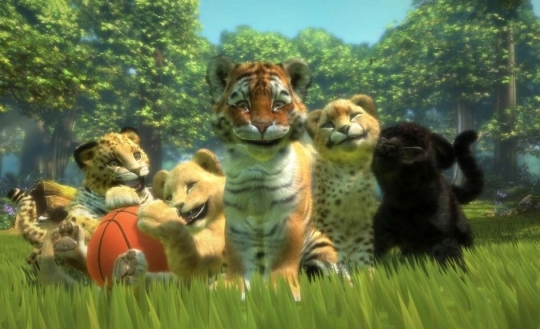 These minigames range from throwing a ball at a target, maneuvering through an obstacle course, batting a ball into the air and a variety of others are definitely some of the best moments in Kinectimals outside of taking care of and interacting with your cub. As I mentioned before the only game with minor detection issues are those involving tossing motions, while the obstacle course is quite adorable as you perform the actions displayed by Bumble to help your cub make its way through the course. There is an underlying purpose to these different minigames and tricks however as you are able to complete a variety of different challenges that provide new toys, areas and even a handful of new cubs to play with as time goes on. The more challenges you complete the more variety can be found within Kinectimals. To top it off there is also a small money system involved with these challenges. Money can be used to buy different toys and collars that have been unlocked through the challenges and even furniture that you can decorate your cub’s home with. Yes you are able to customize the home of the cub you are playing with, though only by changing an item with a similarly typed item. This means that while there is customization it is somewhat limited by the pre-set model. While younger children and even pre-teens will find themselves easily drawn in by Kinectimals cute and beautiful visuals and the lifelike wild cubs, more discerning gamers will still find a wonderful experience inside of Kinectimals. Surprisingly enough Kinectimals does sport a lengthy amount of game time, but of course that is only if you are set on your goals instead of taking care of your furry cub. Whether it be the challenges, or connecting to your inner child it is nigh-impossible to avoid falling in love with taking care of your cub. The joyful reactions it has to your interactions is simply a sight to behold; making Kinectimals a must have for anyone who either has children or simply knows how to enjoy a cute game. Especially one who loves animals.